On D-Day, while the Marines fought tenaciously to secure a beachhead on Peleliu, the IIIAC landing force scheduled to seize Angaur participated in a feinting movement northward against Babelthuap. The convoy of transports and LSTs carrying the 81st Infantry Division, accompanied by a protective screen of destroyers, hove to off the coast of the huge enemy-held island about noon and began to engage in prelanding activities. Besides serving to confuse the Japanese as to the real target of the American attack, the force afloat provided a handy source of combat-ready troops in the eventuality that the Peleliu landing ran into trouble. Though still untested in combat, the Army division had been training and preparing for this role for over two years. The insignia of the 81st was an angry wildcat, its nickname was the Wildcat Division, and the men referred to themselves as Wildcats. Slated for the Pacific Theater and participation in operation STALEMATE, the Army division debarked in July 1944 at the Hawaiian Islands, its staging area. While the men topped off their stateside training with amphibious exercises, the staff planners busied themselves with the essential tactical and logistical preparations, coordinating them whenever necessary. The assigned target was Angaur Island, situated just south of Peleliu and possessing extensive low level areas which were considered ideal for the construction of a heavy bomber field. The plan continued to be revised through 16 September, at which time the last change became effective. On that date, RCT 323, then serving as IIIAC floating reserve, was designated the Ulithi assault force with orders to proceed immediately on its new mission. The Army officers responsible for planning the Angaur operation were at first handicapped by the lack of intelligence about the terrain and the enemy garrison. Fortunately, recently taken aerial photographs, as well as enemy documents captured on Saipan, reached the staff officers in time to help clarify the situation. As finally evolved, the Angaur landing became a two-pronged assault utilizing two RCTs attacking over separate beaches. RED Beach was located on the northeastern coast of the island; BLUE Beach was situated near the center of the east coast (See Map 6). Two thousand yards of rocky shoreline separated the two landing points. Single lines of advance from both beaches to the interior of the island led straight into the thick, tangled undergrowth of the rain forest. Even though these beaches were the least desirable of any on Angaur the decision of Army planners to land at the two widely separated points was based on sound tactical reasons. These were the absence of a fringing reef at the proposed landing sites and the presence of weaker enemy defenses than existed elsewhere on the island. Major Ushio Goto, the Japanese commander on Angaur, did not have sufficient troops to defend all possible landing points. Even by concentrating his forces to cover only those beaches offering most advantages to an invader, he still had to spread his troops dangerously thin. To thwart the American assault, the major had only his 1st Battalion, 59th Infantry, for General Inoue had withdrawn the remainder of the Angaur garrison to Babelthuap during the latter part of July in the belief that the larger island was the most likely objective of any Allied attack. Subsequent reinforcements from Babelthuap had brought the total Japanese strength on Angaur to 1,400 men. American intelligence overestimated enemy strength, and planners of the 81st Infantry Division expected to encounter no less than two Japanese battalions totalling 2,500 men. The decision to land two regiments in the initial assault was the direct result of this faulty intelligence. garrison within close supporting distance of the southern, western, and eastern beaches. Upon completion of last-minute training, the 81st Division sailed from Hawaii on 12 August for Guadalcanal, where it arrived 12 days later. At Cape Esperance the infantrymen made two practice landings, attempting to simulate battlefield conditions on Angaur. In early September the Western Attack Force departed from Guadalcanal for the Palaus. Confidence prevailed among the infantrymen as they neared their first action. "The troops," commented the Army division history, "were as physically fit as any that ever set forth to war. "3 On the coral beaches of Angaur, in the crucible of combat, the truth of this statement was soon to be tested. On the morning of 12 September, the Western Attack Force moved into position off the Palaus. While other ships proceeded with the task of softening Peleliu's defenses, the two battleships, four light cruisers, and five destroyers of the Angaur Attack Group, commanded by Rear Admiral William H.P. Blandy, began a deliberate and systematic bombardment of their objective. Every known or suspected enemy fortification on the small island was thoroughly blasted by the heavy naval guns, or bombed and strafed by carrier planes flying numerous strikes. Minesweepers and UDT teams, meanwhile, executed their prelanding missions off RED, BLUE, and Green Beaches, the latter an alternate landing site. Early on 15 September, the 1st Marine Division landed on Peleliu and embarked upon its task of wresting a secure beachhead from the defending force. Throughout the day, General Mueller and his men anxiously followed the progress of the assault, for its outcome would determine when the Wildcats would be released from their reserve mission for the Angaur landing. So confident was the Navy that Fox Day, the invasion of Angaur, would be on 16 September that, on the previous evening, in accordance with Navy custom, they fed the soldiers the best evening meal possible, including steak, chicken, frozen strawberries, and other delicacies.4 The 15th passed, however, without the arrival of the expected order. minute preparations for the Angaur assault, then only 18 hours away. Before dawn on Fox Day, 17 September, the warships of the task group under Rear Admiral Blandy sent shells screaming towards Angaur. The fire support plan employed by the Navy provided for fire from 2 battleships, 4 cruisers, 5 destroyers, 9 LCI ( G)s, and 4 LCI ( M)s, the latter firing 20mm and 40mm guns, rockets, and mortars.6 Heavy explosions soon rocked the island. Shortly after 0740, 40 fighter-bombers swept down out of the skies to bomb and strafe enemy positions behind the beaches. At 0810, precisely on schedule, the approach to the shore began. LCIs led the way, blazing away with guns, mortars, and rocket concentrations. The initial assault waves made the journey in LVTs, but following waves were boated in LCVPs and LCMs, for even LSTs could beach with dry ramps on the reef-free shores. RCT 321 landed with two battalions abreast in columns of companies over BLUE Beach at 0830, while RCT 322 did likewise over RED Beach six minutes later. No entrenched Japanese infantry opposed the landing; the only enemy resistance consisted of sporadic mortar, machine gun, and rifle fire, which caused neither casualties nor damage. Shortly thereafter the Japanese conceded that a second landing attempt was more successful and that by 0900 American forces in a strength of about 2,000 men had taken up positions on land, accompanied by a large group of tanks. The American losses for the first day of operations on Angaur were listed as 30 barges blown up and sunk, 20 barges destroyed, and 15 tanks destroyed, a somewhat unreasonable figure in view of the lack of initial Japanese opposition at the beaches. them on paper. Rushing across some 20 yards of slightly inclined, rubble-strewn strips of sand to the crest of a low embankment at the edge of the jungle, the Army troops established a firing line. Then, with the beachheads secure, the men plunged headlong into the semi-dark, almost impenetrable undergrowth. Their immediate objective was Phase Line O-1, some 300 yards inland. On the opposite side of Angaur, meanwhile, the transports carrying RCT 323, the IIIAC floating reserve, were feinting a landing off Saipan Town in hopes of confusing the enemy. The American assault regiments advanced slowly at first from RED and BLUE Beaches. No roads penetrated the almost trackless jungle, whose floor was matted and choked with fallen trees, broken branches, and snarled vines. The sweat-drenched soldiers of the 322d, hacking and groping their way through the undergrowth, found the terrain a much more formidable obstacle than the intermittent mortar, machine gun, and sniper fire from an enemy hidden by the dense foliage. On the beaches, meanwhile, the buildup of men and materiel continued. Upon coming ashore, the medium tanks immediately headed for the frontlines over trails cleared for them by bulldozers. By noon it was apparent that despite the Wildcat's lack of familiarity with combat conditions, they had made a successful amphibious assault. They were now in a position to extend their grip on the island. Although the advance of RCT 322 was progressing on schedule, the 321st had rough going from the very outset. The regiment encountered strongly held enemy fortifications on its southern flank near Rocky Point, on its northern flank near Cape Ngatpokul, and to its front as well. Expansion of the beachhead proved extremely difficult and time-consuming. By late afternoon of Fox Day the accomplishments of his regiments failed to measure up to General Mueller's expectations. Not all of Phase Line O-1, which extended from the northern shore of Angaur about 500 yards southwest of Cape Gallatin to a point roughly 250 yards southwest of Rocky Point had been seized. Furthermore, a 700-yard gap still separated the two regiments. Orders issued for the attack that afternoon were intended to rectify this situation. Before nightfall, General Mueller hoped to occupy more favorable positions and ordered his regiments to probe for a possible weak spot in the enemy defenses, particularly in the area separating the two beachheads. The 322d Infantry Regiment was to push forward to Phase Line O-2, extending generally southward from a point about 400 yards west of O-1 on the north shore to Green Beach on the eastern shore, with emphasis on achieving a juncture with RCT 321 as soon as possible. By 1430 the general attack had been resumed, and the soldiers of both regiments pushed forward all along the line. In the vicinity of BLUE Beach a combination of naval gunfire and bombing and strafing by supporting aircraft failed to eliminate the Japanese pillboxes impeding the advance of the 321st Infantry Regiment. The task of reducing them fell to the foot soldier. Gingerly picking their way over the rubble-strewn sand, riflemen gained positions from which they furnished protective fire until a portable flamethrower could be brought into action. Once the flaming tongue of napalm started licking at the gunport of a pillbox, demolition teams rushed forward to place their charges. No sooner had the walls of the fortification been breached than the riflemen began crawling towards the next pillbox. Though painfully slow, this method was effective. Dusk found some men of RCT 321 beyond Phase Line O-1, but both flanks still lagged short of the first objective. The advance of RCT 322 was progressing smoothly enough in the north, despite the failure of the two assault regiments to effect a juncture. Though RCT 322 managed to establish defensive perimeters along most of Phase Line O-2 in its zone, it still had not been able to push patrols south far enough to join up with the adjacent unit. Out of necessity, both regiments bent their lines to form separate beachheads. on the island, the Japanese garrison commander would make his final stand. The next morning, in a predawn attack, a reinforced Japanese company smashed into the extreme southern flank of 1/321, forcing the Wildcats back some 50 to 75 yards. Nevertheless, the faltering lines soon rallied, and by 0618 division received word that the Japanese counterattack had been stopped. Any premature hope that the attack could now be resumed was doomed when it became apparent that the Japanese had broken off their initial counterattack only in order to regroup. Before long they struck again with renewed vigor and the men of the 1st Battalion were quickly initiated into the ferocity of close combat with a fanatical and determined opponent. The arrival of friendly aircraft and reinforcements after daybreak quickly turned the tide of battle for the beleaguered infantry and slowly the enemy attack subsided. This action marked the first time the 81st Infantry Division found itself in a defensive situation since going ashore. Major Goto, however, had already taken steps to assure the success of his mission. According to his plans, the final and decisive battle for Angaur would be fought elsewhere on the island, in terrain of his choosing. Thus, for the moment, he had no intention of weakening his force unduly despite the confusion that could be created at the exposed beachheads by a well-timed and executed Japanese counterattack. General Mueller's orders for the second day of operations on Angaur called for the attack to jump off at 0900. It so happened that neither regiment moved out on schedule. RCT 322 lagged behind mainly because of the confusion resulting from indiscriminate firing in the rear by nervous and inexperienced service troops that saw a Japanese lurking behind every bush and reacted accordingly. The 321st Infantry Regiment, on the other hand, was delayed by new counterattacks. At 0905 an attack hit the right flank of that regiment, but strafing and bombing runs called down by the air liaison officer quickly broke up the enemy effort. Half an hour later another counterattack struck the southern flank of the regiment. Well-timed and expertly delivered supporting fires from mortars, tanks, and an LCI lying off the beach permitted the Wildcats to hold their ground. At 1045, RCT 321 finally jumped off with two battalions in assault. TO the south, the 1st Battalion assaulted southwestward in the wake of the last abortive Japanese counterattack, only to be halted almost immediately by concentrated fire from enemy fortifications near Rocky Point. Here, to forestall any advance into the interior, the Japanese had constructed a near-perfect defensive system. It consisted of pillboxes, dugouts, rifle pits, and interconnecting trenches, all mutually supporting and capable of delivering fires both to the front and to the flanks. A frontal assault from the beachhead would be prohibitive both in time and in casualties, and so a flanking maneuver was set into motion. 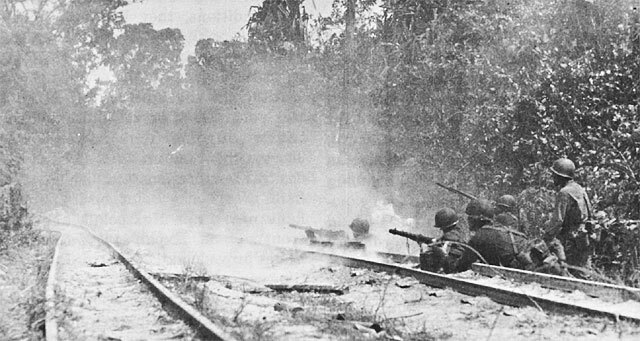 The battalion started inland over the Southern Railroad,12 and followed the tracks for some distance before swerving through the jungle to approach the heavily fortified beach positions from the vulnerable rear. Dense jungle, sniper fire, and a large number of antitank mines all combined to hamper the progress of the battalion. When darkness closed in, the advance elements, still attempting to negotiate the trackless wilderness, were pulled back along the rail embankment to establish a defensive perimeter. 500 yards to the junction of the Southern and the Pacific Railroads. lily this time, supporting fires were falling dangerously close, so the soldiers pulled back along the railroad some 75 yards, and were there joined by Company L, which had advanced behind the lead unit. At this point occurred one of these tragic events that only too often in World War II marred a campaign that was otherwise going well. Six Navy fighter planes suddenly swept out of the skies and subjected the exposed men to heavy bombing and strafing. The full brunt of the attack fell on 3/322. Before the men could take cover or the air strike could be called off, friendly aircraft had killed 7 and wounded 46. An investigation later determined that the incident resulted from an improper marking of the target area and was not the fault of the pilots. Upon learning of the extent of the damage, Genera] Mueller requested all air attacks against Angaur be discontinued until further notice, but this measure, aside from assuring the nonrecurrence of such a blunder for several days, could not undo the damage that had been wrought. It should be noted that on Angaur the enemy may at times have instigated and exploited such incidents. Despite the disorganization resulting from such severe casualties as those inflicted by the ill-timed air strike, the riflemen resumed their advance within half an hour. Pushing forward rapidly the men seized the Japanese phosphate plant north of Saipan by 1400, and during the remainder of the afternoon advanced to within 300 yards of the west coast of Angaur. Infantry-tank patrols, operating in generally open terrain, reached the northern limits of Saipan Town. To the north of the RCT 322 zone, the 2d Battalion passed through the lines of the 1st, which then reverted to regimental reserve. Orders called for the battalion to outflank the rugged hills in the northwestern portion of the island and then to move southward along the western coast until it joined Up with the 3d Battalion. The advancing Wildcats encountered only light resistance, but the terrain grew progressively more rugged. Before long the supporting armor had to be withdrawn, for the broken nature of the ground precluded the use of tanks. The infantrymen doggedly plodded onward, despite intense heat. One platoon, meeting no opposition, continued to Cape Pkulangelul, which formed the northwest tip of Angaur. The regimental commander, aware of the logistical problems involved in supporting such an advanced force, and the tactical difficulties resulting from having a weak unit occupy an exposed and vulnerable position, ordered a withdrawal to Phase Line O-2. 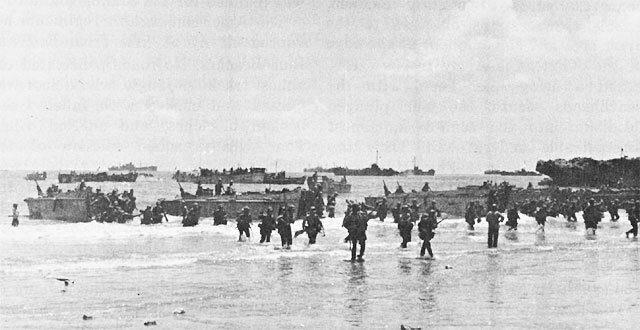 confusion of the initial assault landing, beach congestion had resulted when following waves continued to dump their loads upon the already crowded beaches. As a result, a temporary halt had been called to the unloading and no attempt was made to land artillery until afternoon, when two field artillery battalions were put ashore. By morning of the 18th, all supporting artillery was in position and ready to fire. From the intelligence reports received during the second day, General Mueller gathered that the main Japanese strength was still concentrated on southern Angaur. This belief, coupled with orders to seize the vital level area in the south to facilitate construction of the airfield, impelled the division commander to issue orders calling for a drive southward by both regiments on 19 September to overrun Saipan Town and to divide the enemy forces. At 0730 on the 19th, following heavy preparatory fires, the two rifle regiments jumped off in a determined bid to split the island and its defending force. To the south, RCT 321 attacked with the 3d Battalion on the left, the 2d on the right, and the 1st in reserve. To the north, RCT 322 moved out with three battalions abreast, from left to right the 3d, the 1st, and the 2d. The two battalions on the right advanced southwestward in an attempt to seize all ground south of Phase Line O-4, except for the rugged hills, which would be mopped up later by the 2d. Phase Line O-4 extended eastward from the west coast about 600 yards north of Saipan Town to a point northeast of Saipan where it formed a juncture with Phase Line O-3. The 2d Battalion also had the mission of preventing any escape by the Japanese along the northern coast. 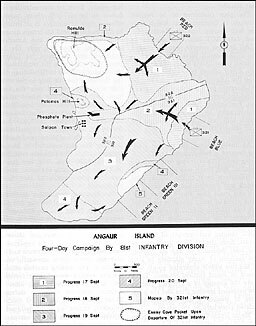 The 3d Battalion was to strike directly through Saipan Town and then occupy the area between Phase Lines O-4 and O-5, the latter extending southeastward from Saipan Town to Beach Green II on the southeastern shore of Angaur. Supported by medium tanks, the two assault companies of 3/322 advanced rapidly from their nighttime positions near the phosphate plant. Only sporadic mortar, machine gun, and rifle fire opposed the advance into Saipan Town. The riflemen encountered a number of enemy pillboxes, bunkers, and other fortifications, but these defenses had been designed to prevent an attack by sea only. Since the Wildcats approached them from the rear, their reduction posed no great problem. Following capture of the town, General Mueller conducted a personal reconnaissance of the front and ordered the drive to the south continued as rapidly as possible. Leaving small details to mop up any Japanese still lurking among the shattered buildings or hiding in caves along the edge of the water, the 3d Battalion started southwards along a railroad that paralleled the shore some 30 yards inland. The fast-moving soldiers encountered only small groups of enemy troops that were quickly bypassed and, by 1600, they had set up night positions on Cape Ngaramudel and the north shore of Garangaoi Cove. and received orders to assemble as a regimental reserve. Subsequently, its mission was to guard the rear area against possible enemy infiltration. The 2d Battalion, on the other hand, reinforced with Company B of the 1st, launched an assault against the northwest hills. A rifle company quickly occupied Palomas Hill, also known as Lighthouse Hill, in the face of only negligible opposition and dispatched a patrol to reconnoiter to the front. This patrol failed to make any headway, for devastating fire from cleverly concealed enemy positions on high ground poured down upon the advancing men. A flanking attempt by Company G, using the Western Railroad to advance from the east, was pinned down by heavy fire from Japanese entrenched in the Lake Salome area. Blocked in every forward movement and with daylight fading rapidly, the battalion pulled back to the phosphate plant to set up night positions. To the south that day, in the RCT 321 zone, tank-infantry teams of the 2d Battalion overcame very light opposition and by 0900 had overrun Middle Village. Seizure of this settlement, some 400 yards east of Saipan Town, was contested only by occasional groups of Japanese infantrymen. Such weak resistance to the advance of the Wildcats encouraged the commanding officer of the 710th Tank Battalion to recommend an armored reconnaissance of southern Angaur. When higher commanders concurred in his proposal, a company of medium tanks, each mounting six or more men, started rolling southward, skirting the western edge of a mangrove swamp in the southeast portion of the island. The remaining riflemen of the 2d Battalion followed more slowly on foot. Before the day ended, this tank-infantry reconnaissance force had completely circled the swamp area--even passing through the fortified eastern beach defenses that were still holding up the advance of the 3d Battalion. Surprisingly enough, this force did not at any time encounter serious opposition. Having reached their objective, the tanks took up positions behind the lines of the 2d Battalion, which extended across the island below the swamp to tie in with 3/322 near Garangaoi Cove. While the above action was in progress, the 3d Battalion of RCT 321 passed through the lines of the 1st Battalion in the eastern part of Angaur to strike southward from the Southern Railroad. In the course of the morning, one column pushed forward along the coast, while the other, attempting a flanking movement inland, soon ran into the mangrove swamp. Negotiating this natural obstacle prove so difficult and time-consuming that the column turned eastward to rejoin the force assaulting along the beach. Here, the same extensive fortifications that had blunted the previous attack barred the way to the south. No sooner had the Wildcats methodically reduced one group of the mutually supporting positions than they drew fire from additional defenses farther down the coast. By early afternoon, the attack had stalled. Even a substantial increase in mortar and artillery support failed to get the advance going again. RCT 321. To fill this void, the 1st Battalion, previously held in reserve, plunged into the morass separating the two assault units. Somehow these men managed to move far enough ahead before nightfall to set up perimeter defenses some 600 yards inland from the 3d Battalion. That night, as General Mueller surveyed the tactical situation confronting his troops, he had every reason to feel confident. Gains for the day had surpassed his expectations, a fact also recognized by General Geiger, who dashed off the following message upon his return from a visit to the frontlines on Angaur: "The advance of your Division today reflects a commendable aggressive spirit. Well done to all hands. "14 The day had also brought capture of the first Japanese prisoner, who identified his unit as the 1st Battalion, 59th Infantry Regiment, 14th Division. According to this source, in June all Japanese troops, except for a garrison of more than a thousand, had departed for Babelthuap. If true, this intelligence was welcome news for the 81st Infantry Division, since the enemy strength was apparently less than had been anticipated. A heavy fight still lay ahead, however, before the entire island of Angaur could be secured. There were, nevertheless, bright spots on the horizon. Already seized was the level terrain for the bomber strip, the main objective of the entire operation. It appeared unlikely that the Japanese would make any serious attempt to reinforce the Angaur garrison in view of the situation on Peleliu. There no longer could be any doubt of the issue on Angaur. The first Marines to arrive on Angaur were members of a reconnaissance party of the 7th AAA Battalion, which landed on 19 September. Upon the arrival of the remainder of the battalion, the Marine unit was closely integrated in the Angaur Island defense plans, operating observation posts along the coast for waterborne targets in addition to being responsible for antiaircraft defense. Still unaware of recent changes in Japanese defensive tactics, General Mueller, as a precautionary measure, alerted all his units to take the necessary steps to fend off any last-ditch banzai charges. The admonition of the division commander was to prove unnecessary. For the Japanese the time had now arrived to withdraw the major portion of their troops into the rugged, coral-ridged hills of northwest Angaur. Here the Japanese commander planned to exploit the natural terrain features to the utmost, forcing the Wildcats to root every last defending Japanese out of caves and dugouts while inflicting the heaviest casualties possible on the attacking force. intent solely upon escaping from the doomed southern portion of the island, however, and gaining the northwestern hills where Major Goto still retained control. Early on 20 September all three battalions of RCT 321 resumed the final drive south to wipe out the two isolated pockets of enemy resistance still remaining there, while RCT 322 continued its assault against the Japanese-held hills to the north. The 322d was forced to divert one battalion northward to assume defensive positions along the second phase line between Lake Aztec and the north coast. This force had the mission of blocking any possible Japanese counterattack against RED Beach, which at the time was still congested with supplies and materiel. Since another of his battalions was stationed below Saipan Town, the regimental commander, Colonel Benjamin W. Venable, had only his 2d Battalion available for the assault. The soldiers moved out and soon reoccupied Palomas Hill. Upon resuming the advance, the Wildcats found themselves attacking uphill over terrain that greatly favored the defenders, who were entrenched on the commanding heights to the front of the battalion. Every attempt by men of the 2d Battalion to push forward drew such heavy enemy mortar and machine gun fire that it had to be abandoned, Even a flanking maneuver to the east, making use of the Western Railroad, whose tracks cut through the ridges surrounding Lake Salome, failed when three self-propelled 75mm guns which were supporting the rifle company, emerged from the 50-yard- long railroad cut only to be knocked out by enemy action. Except for the recaptured ground at Palomas Hill no additional gains were made, and the men of the 2d Battalion dug in for the night in substantially the same positions they had held on the previous day. Further south that morning, 2/321 with two additional rifle companies and two tank companies, quickly overran the heavily fortified southern beaches. Fortunately for the attackers, these positions, previously held in strength, were now defended by a mere handful of Japanese survivors. The only stiff opposition came from some pillboxes clustered near a tank barrier at the southeastern tip of Angaur. A flamethrower-satchel charge team soon eliminated this threat. By 1100, after detailing one company to mop up any enemy personnel that had been overlooked, the reinforced battalion was able to throw its weight against the southeast beaches, where Japanese diehards had for some time delayed the advance of the 3d Battalion. battle for Angaur began and the end of Japanese resistance was in sight. Only the inevitable mopping up by small details remained to be accomplished on southern Angaur. This was done the following day. Earlier on 20 September, General Mueller had forwarded the following message to IIIAC: "All organized resistance ceased on Angaur at 1034. Island secure. "15 General Mueller made this statement because Major Goto no longer had the capability of posing a serious threat to the hold of the Army on Angaur. All necessary ground for the construction of the airfield and base installations had already been seized; an estimated 850 Japanese had been killed;16 and the approximately 350 enemy troops that division intelligence figured were left had been compressed into the northwestern hills which were completely sealed off. What none of the Wildcats could visualize at this time, any more than the Marines on Peleliu, was that the elimination of such a relatively small and isolated pocket of enemy resistance would require an all-out effort by an entire infantry regiment, and that such an operation would drag on for yet another month. The final Japanese defensive positions were located in the highest and most rugged portion of Angaur amidst the northwestern hill mass. Here the Japanese set up a well-conceived and constructed defensive system, utilizing the broken nature of the terrain to the utmost. Caves were dug, fire lanes cleared, and the artillery, mortars, antitank weapons, and machine guns sited in mutually supporting positions to exploit the defensive quality of the terrain and to thwart any infantry assault. Since practically every emplacement was hidden underground, the Japanese were for all practical purposes immune to naval gunfire, artillery, or air strikes. The attackers, on the other hand, could make little use of supporting armor, for the jumbled configuration of the ridges prohibited any closely coordinated tank-infantry assault. Only the most determined rushes by American riflemen could displace the entrenched enemy from his last-ditch positions. Once again the enemy deployment and his complete knowledge of the forbidding terrain met every attack that the Wildcats could muster. The Japanese made effective use of machine guns, rifles, antitank guns, and mortars from concealed positions on commanding ground. These weapons were fired only when the chances that the shots would find their mark were good and when it appeared that the weapons and their crews would not be seen by the attacking infantrymen. Since the Japanese used smokeless and flashless powder, the locating of a weapon by even the most alert observer was practically impossible. In short, the northwest hills of Angaur had been transformed into a virtual fortress, a miniature version of Umurbrogol Mountain on Peleliu, whose reduction was also to prove difficult, costly, and time-consuming. Reduction of the enemy redoubt fell to RCT 322, because on 21 September the tactical situation on Peleliu made necessary the transfer of RCT 321 to that island. Further, because of the restricted area of the pocket, there was room for only one rifle regiment to maneuver. Subsequently, for over a month, the men of RCT 322 were forced to fight, live, and die among the jumbled, jungle-cloaked coral ridges, spires, and cliffs of northwestern Angaur before the last enemy holdout had been either killed or captured. Japanese Soldiers: This island is surrounded by the American forces, and there is no reason for you to continue fighting against us. Further resistance is hopeless. Your communication and supply lines are cut. The Japanese Navy is far away. If you resist further, you will surely die by starvation and bombardment. If you cease fighting and come to us immediately, one by one, unarmed and with your hands up, you will receive food, clothing, and medical care. Only a sprinkling of Japanese surrendered, one of them after the first broadcast, and another immediately following the second. On the whole, the results obtained were disappointing and it seemed that the Japanese required more demonstration of the power of the attacking force. enemy resistance. All other control concerning Angaur was passed on 14 October from General Mueller to the island commander, Colonel Ray A. Dunn, USA, whose mission it was to develop the island as a forward airbase. On the same date the Marine 7th AAA Battalion was relieved from attachment to the 81st Infantry Division and assigned to the Angaur Garrison Force, while still remaining under operational control of the division. The indomitable Major Goto survived every American attack right up to the night of 19 October, when his luck finally ran out and he was killed. A few other Japanese, determined to escape from an untenable situation, decided to swim to Peleliu. One actually covered the seven-mile stretch before he was observed. The fate of those Japanese remaining on Angaur was now sealed, and on 21 October triumphant Wildcats overran the last remaining organized enemy position. This action terminated the tactical phase of the operation, even though a few Japanese stragglers inevitably remained. RCT 322 was withdrawn to the southern part of Angaur for rest and recuperation, leaving only a couple of supporting units in the area to seek out and annihilate whatever Japanese still lurked there. The capture of Angaur was of prime importance because it eliminated a threat to Allied lines of communication that stretched across the western Pacific towards the Philippines. Angaur provided the Allies with another badly needed air base in a forward area. Construction of an airfield on Angaur had begun as early as 20 September, and the first aircraft touched down on the field on 15 October. It should be noted that since the island had not previously harbored any Japanese air installation the work had to start from scratch. First tasks were cutting back the jungle, filling swamps, and levelling very rough terrain. The men of the 81st Infantry Division emerged from the Angaur operation more combat-wise and more certain of their ability to deal with a fanatical enemy. The lessons they had learned during the first combat action on Angaur were soon to serve the Wildcats well during the even more difficult and challenging mission awaiting them on Peleliu. 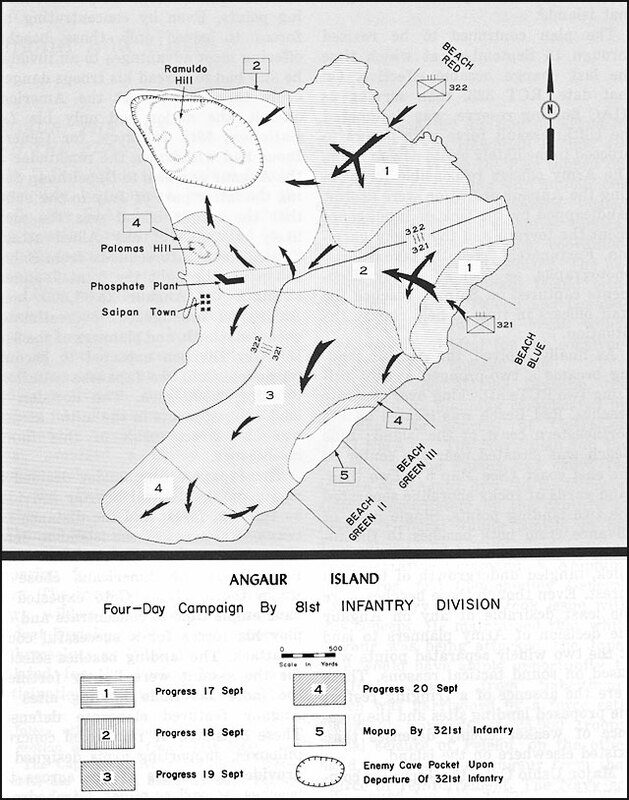 The original concept of the STALEMATE II Operation envisioned the employment of a regimental combat team of the 81st Infantry Division to seize Angaur Island before the invasion of Peleliu got under way. Following the successful completion of this mission, it was planned that the division was to be further employed in operations against Yap, an island 258 miles northeast of the Palaus, with one RCT to be engaged in independent action under Navy control against Ulithi, an atoll about halfway between the Palaus and Yap. Preliminary planning by the division for the consummation of this concept provided for the employment of RCT 322 on Angaur Island and RCT 321 on Ulithi Atoll. When revised estimates of enemy strength made it necessary to plan for the commitment of two RCTs on Angaur, RCT 321 was removed from consideration as the landing force to seize Ulithi and was reassigned to the Angaur assault. RCT 323 then was assigned the Ulithi operation; planning for it was begun on 1 August 1944.
involved abandoning the plan to capture the Yap Island Group and assigning the mission of seizing Ulithi to a combat team of the 77th Infantry Division. The 77th and 96th Infantry Divisions, initially scheduled for the Yap-Ulithi assault, had been transferred to General MacArthur to form part of his invasion force for the Leyte landing. Only one uncommitted regiment, RCT 323, remained under Wilkinson's control. On 16 September General Mueller was advised that one combat team of the division would constitute the landing force to capture Ulithi. RCT 323 was designated as the landing force. The Ulithi Attack Group was commanded by Rear Admiral Blandy and consisted of a cruiser, 9 destroyers, 3 patrol vessels, 12 landing craft, gunboats, 2 high-speed troop transports, and 5 attack transports and cargo vessels. was to be landed on one of the southern islands of the atoll to remove a few natives for intelligence purposes. On Jig Day a reinforced rifle company was to capture KEENSET Island to permit the emplacement of the combat team artillery in support of subsequent ship to shore operations against the northern islands of the atoll. The remainder of the BLT furnishing troops for the capture of KEENSET was to be prepared to capture LITHARGE Island. Upon completion of artillery registration firing and on order, a second BLT was to capture and defend IDENTICAL Island. During these operations, reconnaissance detachments were to reconnoiter and mop-up the small islands in the west central portion of the atoll. On Jig Day plus 1, artillery and cannon-supported shore-to-shore operations were to be carried out against AMELIORATE and ACETYLENE Islands. Reconnaissance detachments were to be prepared to assist, on order, in reconnoitering and mopping up AGGRAVATE, LOSSAU, the remaining small islands to the south, and the islets eastward of the main atoll. 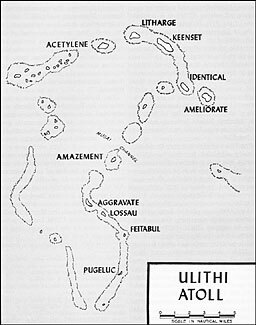 The Ulithi Attack Force proceeded as planned. Troops, equipment, and supplies had been combat loaded at Oahu, Hawaii in anticipation that RCT 323 would be employed as reserve in the Palau Operation or in an assault landing on Ulithi. Movement to the objective area was made in two echelons. The reconnaissance detachment, consisting of the Intelligence & Reconnaissance Platoon, 323d Infantry Regiment, reinforced with 24 enlisted men from one of the rifle companies, departed from the Palau area at 1330, 19 September. It arrived off Ulithi during the early morning of 21 September awaiting orders from the Commander, Ulithi Fire Support Group, under whose command the reconnaissance was to be effected. The remainder of the force departed at 1000, 21 September. Both echelons made the movement without incident. The afternoon of 21 September saw the completion of final plans for the landing of a reconnaissance detachment on AMAZEMENT Island. Mission of this unit was to secure Mugai Channel for minesweeping and underwater demolition operations which were to be conducted in the lagoon on that date. It was decided that a preliminary offshore reconnaissance of the island was to be conducted that afternoon to determine the best beach for a landing. In the event that the reconnaissance was made without interference, troops would land that afternoon to seize the island. The reconnaissance was carried out as planned and subsequently the reconnaissance detachment landed unopposed at 1515. A thorough search revealed no sign of recent habitation. Thirteen men stayed on the island, and the remainder returned to the ship. During the early morning of 22 September, orders were issued to carry out a landing on AGGRAVATE Island for the purpose of removing a few natives for questioning. A detachment debarked in two rubber boats and proceeded towards the island. The entire shore was fringed with a coral reef extending out from the beach for about 150 yards. When the troops went ashore, they encountered two natives, who approached in a friendly fashion and agreed to accompany the troops back to the ship. Their interrogation revealed that the Japanese garrison force had departed a few months earlier and that there were no Japanese on the atoll except for a crippled one on AMELIORATE Island. A thorough search of KEENSET Island failed to reveal any sign of recent occupation, though several Japanese graves were found. A search of LITHARGE Island likewise showed negative results. During the morning of 23 September, elements of RCT 323 landed unopposed on AMELIORATE, which was officially declared secure at 1315. Once again no Japanese were found on the island, not even the reported cripple. A considerable number of inhabitants had taken refuge in a shallow cave in the northwestern part of AMELIORATE. After much coaxing about 30 natives were persuaded to return to their homes in the village. For the remainder of the day and throughout the next natives continued to leave their hiding places. In all, about 100 returned to the village.~~ Occupation of IDENTICAL Island commenced at 1300, 23 September, when assault waves came ashore and found neither enemy nor natives on the island, though the bodies of two Japanese, apparently dead for several days, were discovered floating in shallow water. The seizure of LITHARGE and ACETYLENE Islands rounded out the operation, which was to become prominent for the absence of enemy resistance. Ulithi Atoll contained a 300-berth anchorage and a seaplane base. Occupation of these Western Caroline islands provided still another base from which future operations against the enemy could be supported. The construction of an airstrip on AMELIORATE Island made possible fighter plane protection for the anchorage and afforded a base from which U.S. aircraft could continue neutralization of the nearby Japanese bases on Yap. Together with Angaur and Peleliu Islands to the southwest and Guam, Tinian, and Saipan to the northeast, the capture of Ulithi Atoll completed a line of American bases that isolated Japanese holdings in the Central and South Pacific. The occupation of Ulithi Atoll further denied it to the enemy as a fleet anchorage, weather and radio station, and possible air and submarine base, in addition to precluding its use by the enemy to observe and report the activities of American forces in the sector. By 25 September the unloading of all the support ships had been completed and Vice Admiral John H. Hoover, Commander, Forward Areas Western Pacific, took over the task of developing Ulithi. Atoll into an advanced fleet base. Within a month after the capture of Ulithi, more than a hundred Navy craft from self-propelled types to lighters, floating drydocks, barges, landing craft, and seaplane wrecking derricks were en route to the island. During subsequent operations in the Philippines, the U.S. Pacific Fleet found Ulithi to be an extremely valuable base. Prior to the invasion of Okinawa, the island served as a staging area for fleet and amphibious forces. The atoll thus fulfilled a vital strategic role in the final phase of World War H.
1. Unless otherwise noted, the material in this section is derived from: 81st InfDiv Op Rpt, The Capture of Angaur Island, 17Sep-220ct44, dtd 26Dec44, hereafter 81st InfDiv OpRpt-Angaur; Historical Committee, 81st Infantry Division; Smith, Approach to the Philippines; Morison, Leyte; Hough, Assault on Peleliu. 3. Historical Committee, 81st lnfantry Division, p. 65. 5. Unless otherwise noted the material in this section is derived from: 81st InfDiv OpRpt--Angaur; RCT 321 OpRpt, The Capture of Angaur Island, 1Jul-30Sep44, dtd 26Nov44, hereafter RCT 321 OpRept--Angaur; RCT 322 OpRpt, Angaur Island--Palaus Group, 1Jul-23Oct44, dtd 1Dec33 [sic], hereafter RCT 322 OpRpt--Angaur; Japanese CenPac Ops; Peleliu Comment File; Historical Committee, 81st Infantry Division; Smith, Approach to the Philippines; Morison, Leyte; Hough, Assault on Peleliu. 6. Anx C, 81st InfDiv FO No. 7, dtd 5Aug44. 8. IIIAC C-2 Rpt No. 7, dtd 21Sep44. 9. "Stern measures were instituted to suppress the tendency toward trigger-happiness." Historical Committee, 81st Infantry Division, p. 78. 10. Palau Sector Group Headquarters; Palau Sector Group training order entitled "Training for Victory," dtd 11Ju144, Item No. 11,190 in CinCPac-CinCPOA Translations No. 3, dtd 7Nov44. 13. Col Arthur T. Mason ltr to CMC, dtd 28Feb50, in Peleliu Comment File. 14. Historical Committee, 81st Infantry Division, p. 93. 15. Historical Committee, 81st Infantry Division, p. 98. 16. "This casualty figure was an overestimation. Probably fewer than 600 Japanese had been killed through the 20th, and Major Goto still had possibly 750 men with which to conduct an organized defense in the northwest." Smith, Approach to the Philippines, p. 518. 17. Historical Committee, 81st Infantry Division, p. 111. 19. Japanese Ops in the CenPac, p. 192. 20. 81st InfDiv OpRpt, Sec IX, p. 69. 22. "To die is lighter than the birds' feathers," and "to die is like the blossoms of the cherry tree falling down." LtGen Sadae Inoue in Worden ltr. 23. Unless otherwise noted, the material in this section is derived from: 81st InfDiv OpRpt-Angaur; 81st InffDiv OpRpt--Ulithi Atoll and other Western Caroline Islands; Marine Air Base Ulithi--Rpts and Correspondence re: Base Development Plans, dtd 0ct44-Jul45; MAG-45, Rpt of Op, dtd 23Jan45, hereafter MAG-45, Rpt of Op; Historical Committee, 81st Infantry Division; Hough, Assault on Peleliu; Morison, Leyte; Smith, Approach to the Philippines. 25. "Navy officers sometimes have difficulty in understanding how idle troops can serve any useful purpose aboard ship while fighting is going on ashore." Smith interview. 26. Attack Order No. A268-44, ComGroupOne, PhibsPac, dtd 15Sep44. 27. 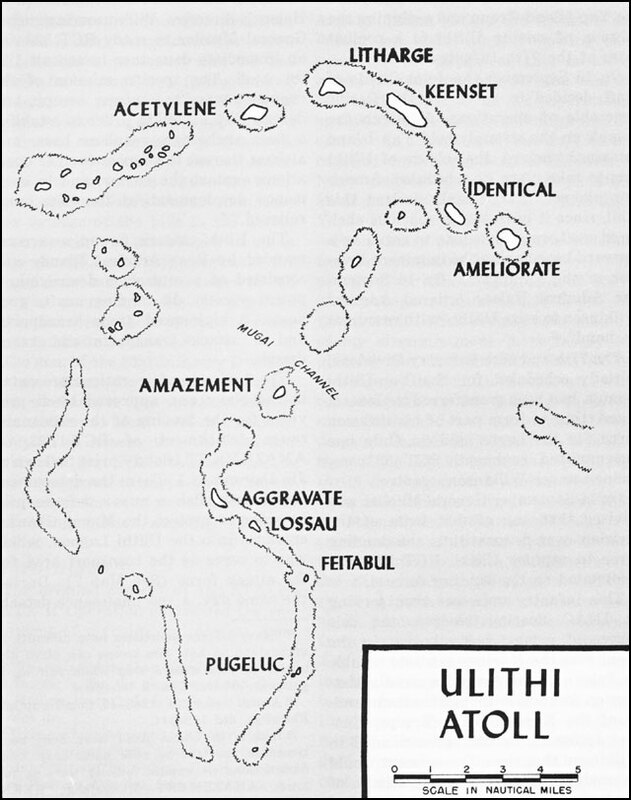 Islands in Ulithi Atoll have been mentioned in the text by code name only. Code designations (in capital letters) were as follows: AMAZEMENT--Mangejang; KEENSET--Sorlen; LITHARGE--Mogmog; AMELIORATE--Falalop; ACETYLENE--Potangeras; AGGREGATE--Fassarai; IDENTICAL--Asor. 28. 81st InfDiv OpRpt, Ulithi, p. 17. According to Historical Committee, 81st Infantry Division, no Japanese or natives were encountered on AMELIORATE.